Ooh I just picked a sprig each of fresh oregano and basil from our backyard garden, and chopped them for my fried egg breakfast. I’ve never had fresh oregano and wow, it’s wonderful. I’m so lucky. So, fried egg (fried in 1/2 tsp coconut oil in cast iron) with chopped herbs, garnished with a couple spoonfuls of salsa and topped with more fresh herbs. And a side of fresh baked rosemary whole grain bread. Life is good! My First Homemade Avocado Guacamole! 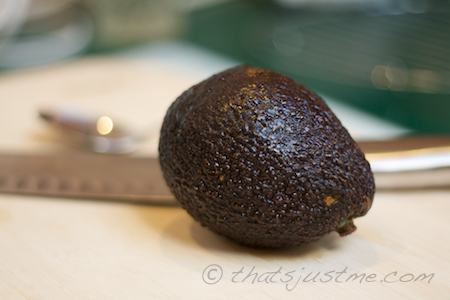 So, I finally got around to using one of the avocados I bought from Whole Foods last week. They were definitely ripe, so I put them all in the fridge for safe keeping. This morning I decided it was time to use one for lunch. Author debbie @ That's Just MePosted on May 4, 2010 June 12, 2010 Categories RecipesTags avocado, FOOD, guacamole, healthy, Recipes, turkey, vegetablesLeave a comment on My First Homemade Avocado Guacamole! I am thrilled! 157.6 pounds, that’s 42.4 pounds total! whoo hoo! Having the family over for Easter today for a spring BBQ. I have a turkey burger for me, with a piece of whole grain bread. I will probably even have a Coleman Non Cured hot dog, but we’ll see. I might save the calories for dessert! Homemade Boston Cream Pie! My mom is bringing her famous potato kugel and I know I will have some of that too! My sister is bringing salad and I am looking forward to that! Yum, it’s going to be a delicious day! Healthy too! ETA: did okay today! It was a fantastic day with the family and I ate a nice piece of boston cream pie (which is actually cake) and after it was all said and done, I went over about 400 calories, but if you count my calorie deficit, then it was actually only 150 over. So I did alright! I feel pretty stuffed right now but tomorrow is a new day and I’ll be back on track! Author debbie @ That's Just MePosted on April 4, 2010 April 7, 2010 Categories Weigh inTags FOOD, healthy, holidays, turkeyLeave a comment on 157.6 – Happy Easter! I have made mini meatloaves a few times, and it works out very well. 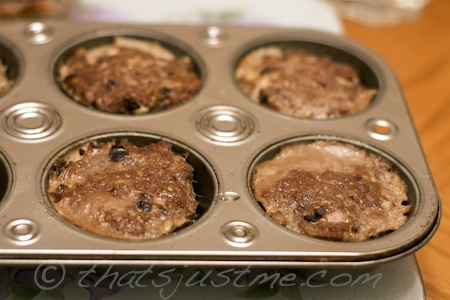 I divide my meatloaf mixture into a cupcake tin and/or ramekins for easier portion control. Plus it bakes quicker! 2 oz Friendship Farmers Cheese – If you have never used Farmer’s Cheese, check it out. It’s similar to feta, but it’s got a creamier texture like whipped cream cheese. The Friendship brand is very low in calories. 1 oz = 50 calories. Bake at 350° for 20-30 minutes or until cooked through. You might need to use a cookie sheet under if there is spill over. It definitely had a strong olive taste. I love olive oil, so I am really trying to eat more whole olives. Even though I am not a huge olive fan, I keep trying to add small amounts while cooking. I might try using a little less olives next time. I cook for only two of us, so a benefit of this recipe is there are always left-overs. I slice them into smaller chunks and add them to tomato sauce for the next night’s dinner. 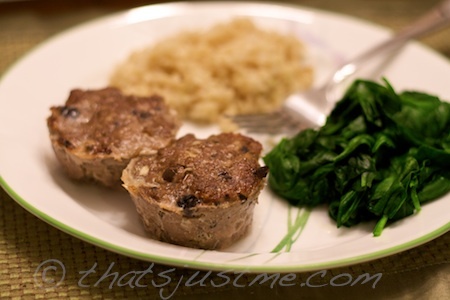 I served the mini meatloaves with huge portion of spinach and some brown rice.